Hello Adaen, I hope things are going well for you. I was looking for old links in google when I came upon this, and thought you deserved an answer. I’m still around, still interested in rpgs, but still rather dismayed at the nature of the online world and not very active in it. I never returned to rpg.net, which at the time *was* the Internet for me after gaming outpost had effectively died and The Forge become Ron’s personal playground. Leaving there and taking down my AoH website was a total break. I did make short stops at a few other sites over the years looking for one that I felt at least a partial fit for, but that goal makes seeking the questing beast appear rational. I never stayed long. So lurking for information on new games will remain just about my only connection, and that has been dimming as each year I see the hobby drifting further away from anything I’m interested in. Thanks for your note. Things are going well…though I’m in the end-of-the-year crunch (so it goes). I understand your thoughts on the online world, but am still somewhat disappointed. 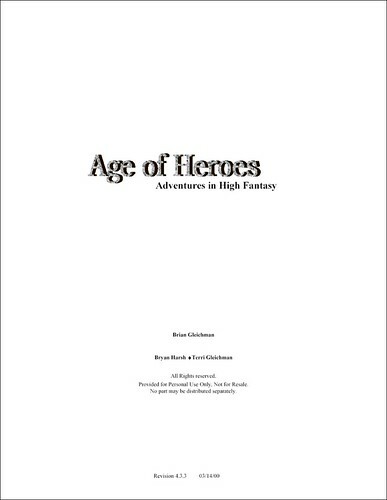 It is a shame to not have Age of Heroes out there anymore. And your articles were a breath of fresh air. Even if you didn’t want to get into the whole forum discussion type of online presence, I’d urge you to reconsider some of your position with regard to self-publication and articles. I hope you won’t mind if I contact you offline. Been horribly busy of late, so it took me a while to come back and answer this. I’m not sure where I’d publish articles even if I had a mind to, I could get a blog like this I suppose but I wouldn’t update it very often as I’m not really connected to much of the gaming scene anymore. Thus it would just sort of hang out there unvisited because I don’t write enough to keep people coming. Thanks for your comments. If you’d like a pulpit for articles, musings, etc., I’d be happy for you to post here. Please let me know if you’d like an account setup (just in case). Come on, you know you still have things to say….and there are people who would appreciate hearing them. And it might be fun! Maybe the bustle of the RPG Forum-space is not your bag, but there may be another way to be involved…at the level you deem appropriate at any given time without any expectations of commitments. In any case, all the best to you and yours. Thanks Adaen, I’ll give it some thought. The Deadlands and HERO house rules are there, as are the elements articles and some other stuff. Hey, Brian. How are you?